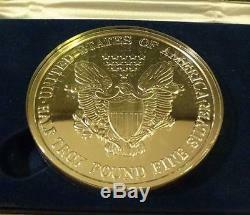 999 Fine Silver AMERICAN EAGLE Design Proof Round. Mint, Original Box, the 2000. One Half Troy Pound Pure. 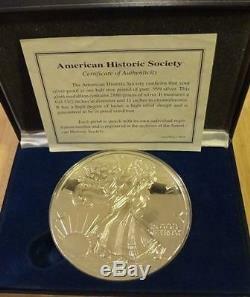 999 Silver Eagle Proof Coin, from the American Historic Society. This GIANT medallion contains 2880 grains of silver, about 188 grams. Measures a full 3 ½ in diameter and 11 in circumference. High Degree of Luster and in Proof condition. Certificate of Authenticity included with it mint condition leather-like case. 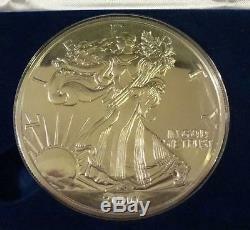 PLEASE CONSULT THE PHOTOS FOR FURTHER DESCRIPTION, IT IS THE EXACT 1/2 TROY POUND.